As a building contractor, the best thing you can do is stock your inventory at the lowest price possible. This is something that cannot be achieved at the local home improvement store. It is impossible to get an exceptionally good deal from the huge retail chains because they have already bought their supply in bulk at a discounted rate. In order for these chains to get their money back and earn a profit, they must hike up the cost. There is something to be learned from these huge retailers. Sure, they may have billions of dollars to purchase a high volume of marble tiles for their warehouses, but that doesn’t mean that this privilege is allotted to these big businesses only. Small businesses, independent contractors, builders, architects, and designers can all take a page from the retailer’s playbook. If they can buy marble tile at a wholesale price, then why can’t you? Wholesalers want to be able to sell to customers who have the resources to buy in bulk. Although buying marble tiles at a wholesale price is certainly cost beneficial to the budget, it’s still going to cost a significant amount of money. Wholesale distributors will require a minimal purchase amount. Even though that amount is costly, it is guaranteed to be cheaper than buying the same number over a period of time. Having a storefront operation is fine and well, but if you are seriously considering buying marble in bulk, you will need a place to store it. Some wholesale distributors will not deliver their product unless they know that the buyer has a decent amount of space to store it. It also needs to be located in place where their large trucks can drive in and make the delivery. Some wholesale distributors will drive your product across country to deliver your beautiful marble product, but it is up to the buyer to transport it from the truck to the warehouse. A wholesale distributor like Nalboor Tiles delivers their tile in crates, and it’s quite heavy! If you don’t have a forklift, there are companies that rent them out. This is key. As finding a wholesale distributor is as easy as typing in a few letters on your computer, finding the right wholesale distributor takes a little more research. It is always best to find at least three wholesale distributors that appeal to your interests. Once you’ve done that, then it’s time to start the research and begin comparing the three with one another. What does their website look like? What kind of marble tiles do they offer? What is their unit price? Exactly how much are they willing to negotiate, if at all? How long will it take to fill the order? Do they deliver? Do they provide samples? Most importantly, how knowledgeable is their customer service department? There are many wholesale distributors who are only concerned with closing a sale. Nalboor Tiles’ warm and friendly customer service department welcomes any questions you might have regarding the purchase of your marble tile. They will also provide you with other options to supplement your bulk order. As a marble supplier, it is wise to know the difference between real marble and materials that look like it. This knowledge can work to your advantage in a few ways. First, it is always good to be more informed about the product that you are selling than the buyer. So the more you know about marble and any other type of stone material, the more of an expert you will appear in your buyer’s eyes. 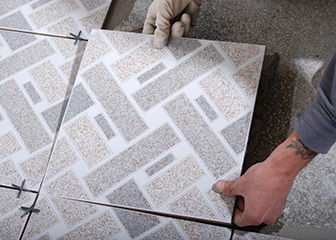 If you are considering buying marble tile in bulk, chances are business is going well. It is also highly likely that there are future building contracts that are in line waiting for the current project to be completed. Buying marble tiles in bulk gives you the opportunity to purchase materials for these future projects at a discounted price, reducing your expenses and saving you a great deal of money to your annual budget. Here’s where calculations can go all wrong. When pricing for marble tile, many buyers neglect to add in the shipping cost to their buying budget. Marble is heavy. Shipments are all determined by weight so be sure to ask your wholesale distributor approximately how much will your shipment cost. Here at Nalboor Tiles, we offer more than marble tiles. We offer a range of natural stone, mosaic, engineered, and porcelain tiles. As marble is the most expensive type of stone, you can also stock your inventory with tile that looks just as good as marble but cost less, saving your own buyers money. Customers will appreciate this and may very return for more product. Call Nalboor Tiles at 1-305-501-4548. Our offices are open Monday – Friday from 9am – 5pm EST or visit our website here.